THIS WEEK'S QUESTION: What is Robert Redford’s best performance of his career? 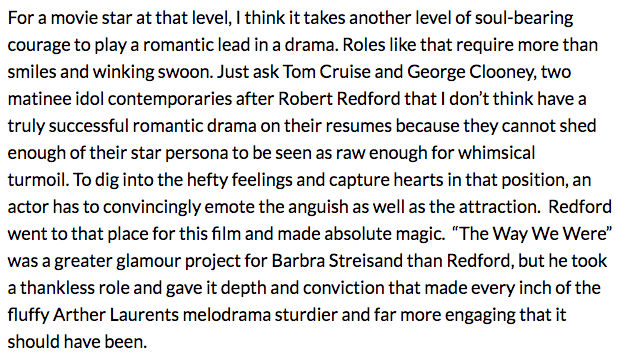 After a little mini-hiatus due to all big-wig eyes and feet descending on the Toronto International Film Festival, David Ehrlich’s survey returned to reflect on the soon-to-be-retired (or maybe not) career of Robert Redford. October’s The Old Man & the Gun is reportedly his final role. We were asked to name his career best. Thanks to being my mother’s favorite, I’ve been raised to be a big Redford fan. Many choices were available, but I grabbed the alphabetical anchorman position to celebrate his romantic lead in The Way We Were. My second and third place picks for this question would have been All is Lost and The Candidate, but I could go all day to Sneakers, The Sting, or Butch Cassidy and the Sundance Kid.